Today’s how-to pertains to roasted root veggies. Also known as, vegetables that taste like candy and are addictive as crack. The directions below are adapted from Yellow Rose Recipes, an (unfortunately) out-of-print cookbook that gets a ton of use in my kitchen. Anyway, this is a comforting winter side that’s easy-to-make, all-around delicious and healthy. ♥ Preheat oven to 400 degrees. Peel yer veggies and chip-chop them into 3/4-1-inch pieces. ♥ In a large bowl, whisk together the rest of the ingredients. ♥ Add the roots and toss. 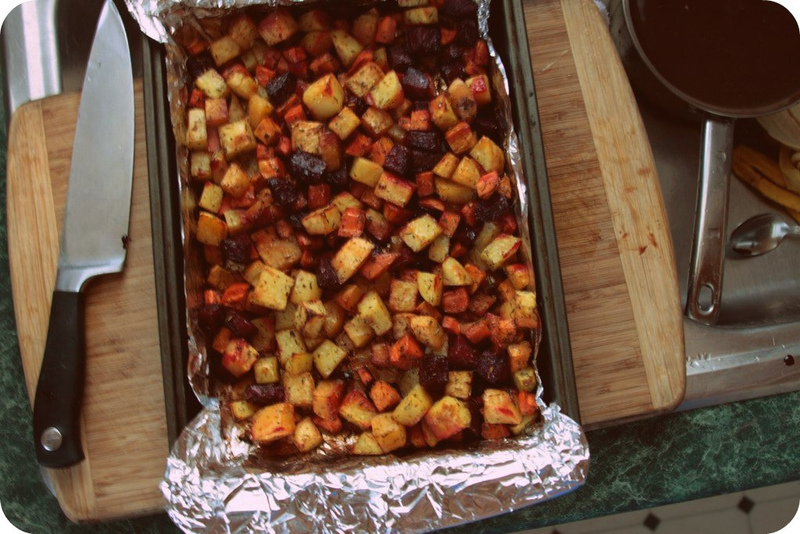 ♥ Add veggies to a lightly sprayed 9-by-13 inch baking dish or roasting pan. ♥ Roast for 20 minutes, remove from oven, toss around with a wooden spoon, and put back in oven for 20-30 more minutes. Your kitchen’s going to smell delicious! ♥ Remove and serve, adding more salt and pepper if necessary. Roasted roots go well with pretty much anything, and I like to think they taste even better the next day. Try piling a scoop or two over some arugula and top with goat cheese for a super veggie-licious lunch. Yum! This entry was posted in How-Tos and tagged cooking, domesticity, how to, recipe by highplainsthrifter. Bookmark the permalink. I love roasted veggies so much. I especially love roasting sweet potatoes with sea salt, olive oil, a squeeze of lime, and chipotle seasoning from Penzey’s. Yum~! Looks AMAZING. Can’t wait to be off this dang detox and back on root vegetables!! 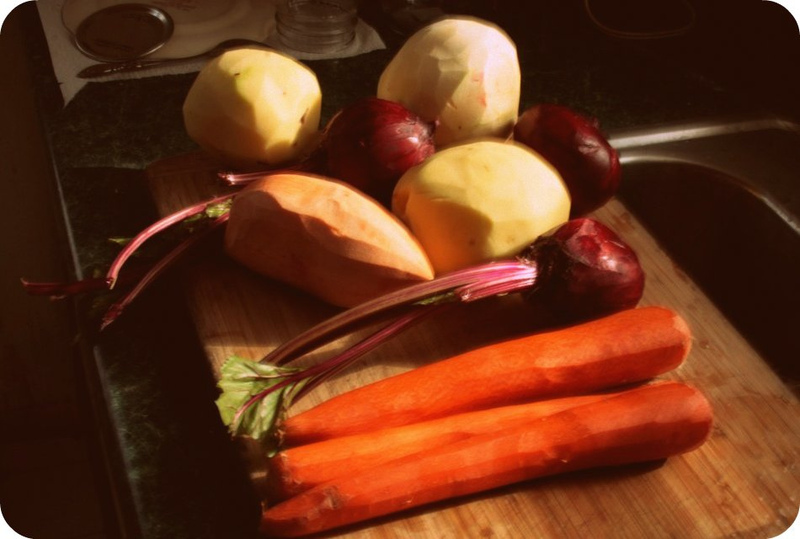 What detox doesn’t allow you root veggies??? Diets blow!